Summer of Food and Fun is ON! HIP is serving 200 nutritious meals a day to children and families in need. The sun is shining, the birds are singing, and kids are eating summer meals! Now that summer is here, we have officially started our Summer Eats Program, which provides lunches and activities to kids and their families every weekday until August 28th. 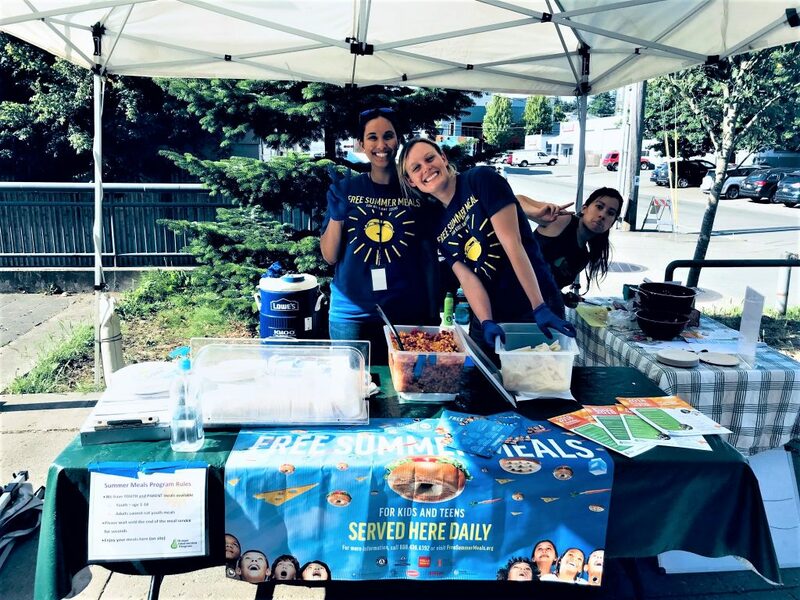 We are serving meals at nine sites all throughout northeast Seattle and southeast Shoreline. For a list of all the sites and meal times, see our web page here. We recognize that kids who need food assistance during the school year don’t suddenly stop needing help over the summer. Therefore, these meals, combined with weekend HIP Packs on Fridays in partnership with the University District Food Bank, are meant to ensure that the health and nutrition gained during the school year continue to progress and allow our community’s youth to flourish and thrive. We also recognize that if kids are hungry, their parents are probably hungry as well, so we serve meals for parents. No one is turned away! To make the meals more engaging, we have partnered with many volunteers and organizations to provide fun activities for participants to enjoy. Some of these partners include Skate Like A Girl, Seattle United, All That Dance, Reptile Man, Bureau of Fearless Ideas, Seattle ReCreative, and more! With seven open meal sites every weekday, however, there is always a need for more volunteer-led activities, so if you have a hankering to provide summer fun, don’t hesitate to get in touch! Finally, it’s important to recognize all of the amazing volunteers and donors like you who have made this summer so fantastic thus far. We couldn’t do it without you, and we are immensely grateful for your service. Here’s to another month of summer magic!